The Ford EcoSport is set to receive a significant update for LA motor show next week. Ford announced on Twitter. DJ Khaled, who will apparently be involved in the revealing, previously mentioned it on the Snapchat. Ford has hinted at bringing the EcoSport to the U.S. as far back as 2014, and the test mules haves been spotted around the company’s Dearborn, Michigan, development center for a while. Along with crossover sales booming, this is probably ideal time to launch the EcoSport here. The 2017 model year will be barring a few cosmetic changes inspired from Ford Edge and Kuga. In terms of features, the updated EcoSport will see a range of new features including the advanced SYNC 3 infotainment system. 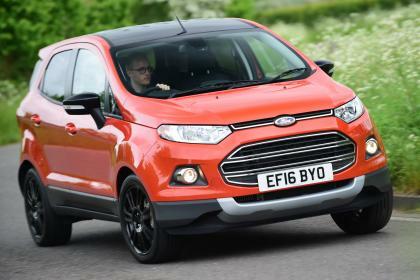 In the European market, Ford will offer the EcoSport with three powertrain options – 1.0-litre EcoBoost, 1.5-litre Duratorq and 1.5-litre Duratec. And its South American version will be packed with a new 1.5-litre ‘Dragon’, 3-cylinder petrol engine. Though, there’s no clarity whether the US-spec model will receive this engine or not. The 2017 Ford EcoSport will also get the 4WD system reserved for the top-spec models. If the India-spec model receives this feature, it’ll become the smallest SUV to offer four-wheel drive. In Australia, the Ford EcoSport is currently available in Trend, Ambiente and Titanium variants, offered with the choice of the company’s 92kW/170Nm 1.0-litre EcoBoost 3-cylinder engine mated to a 5-speed manual or a 82kW/140Nm 1.5-litre naturally-aspirated unit paired to a 5-speed manual or 6-speed auto. Inside the new EcoSport is a 5-seater cabin with music booming out of 6 speakers (4 for the base model), along with the Titanium variant having Electronic Air Temperature Control and the leather seats. Standard features include airbags, ABS, and ISOFIX child seat fixings.